It’s not quite what you expect to see on those minimalist Apple Store tables: a stack of paper slips, a stapler and an old-school manual card-swipe machine – but that’s what some stores had to resort to after their Point Of Sale systems went down yesterday. Store staff normally process sales with iPod Touches in cases which combine a cardreader with an external battery. Some customers were reporting that the system outage lasted several hours and affected their ability to collect their Retina iPad Minis, bought online with the Personal Pickup option. The EasyPay self-service checkout app was reportedly still working, but Apple limits the value of transactions that can be paid for in that way. Update, Tues, May 14: It looks like the Groupon POS was launched prematurely and has now been pulled from the App Store. However, today Groupon appears to have rolled out the app as the new Breadcrumb POS app that will now be the face of its payments service for merchants. The old Breadcrumb app, which Groupon acquired last year, will now be called “Breadcrumb Pro”. It appears Groupon is today launching a mobile payments app dubbed “Groupon POS” that will rival Square’s Register app and allow merchants to accept and manage payments directly from an iPad. The company has yet to make an official announcement but the app is already live on the App Store here. Last year Groupon launched a similar app for iPhone called Groupon Merchants alongside its Groupon Payments service that allows business owners to accept payments through a credit card reader available for iOS devices. The iTunes page also says the app will work “with an optional cash drawer and printer,” although its unclear if Groupon plans to sell the hardware directly to customers like Square recently started doing with its business in a box offer. We’ll update with a link to Groupon’s official announcement when/if it makes one. The Square Register app was updated today with a number of new features for merchants on top of a redesigned UI for the iPhone app. Merchants running the Square Register POS app on their iPad will now have access to barcode scanning with the ability to sync a Bluetooth barcode scanner, new easy order modifiers, as well as customizable kitchen tickets. iPhone users of the Square Register app are greeted today with an all new design that adds new features such as custom tipping, smarter payments with multiple custom amounts, and a customizable item library. Square just posted the video above to coincide with the update showing off how owners of Piada in Midtown Manhattan are taking advantage of the Square Register solution. New on iPhone: – Item library: Add items to a sale with a tap. Build your item library to simplify and speed up checkout. Customize items with photos, names, and prices. – Smarter payment pad: Add multiple custom amounts to a sale, add notes to each amount, and view or edit all amounts in one place before charging. – Custom Tipping: Allow customers to enter custom tip amounts. – New look: Ring up customers and edit settings more easily than ever with an all-new design. New on iPad: – Easy order modifiers: Customize orders at the counter and send them to your kitchen while your line keeps moving. – Customizable kitchen tickets: Include a custom name or number on each kitchen ticket. – Barcode scanning: Sync your Bluetooth barcode scanner with Square Register to speed up your checkout. Mobile digital payment company Square announced today on its blog that it will begin selling a “Business in a Box” solution that will act as a full point-of-sale system for iPad-toting business owners. The hardware package starts at $299 and includes two Square Readers, a Heckler Design WindFall iPad Stand, and an APG Vasario 1616 Cash Drawer (as pictured above). For an extra $300, bringing the total price of the package to $599, Square will throw in a Star Micronics TSP143L Receipt Printer. We were able to find all the pieces of the package online (minus the free Square readers) for around $480, although that’s before any taxes or shipping costs. Neighborhood merchants are increasingly adopting Square Register for its simple interface, smart analytics, continuous updates, and low processing fees. 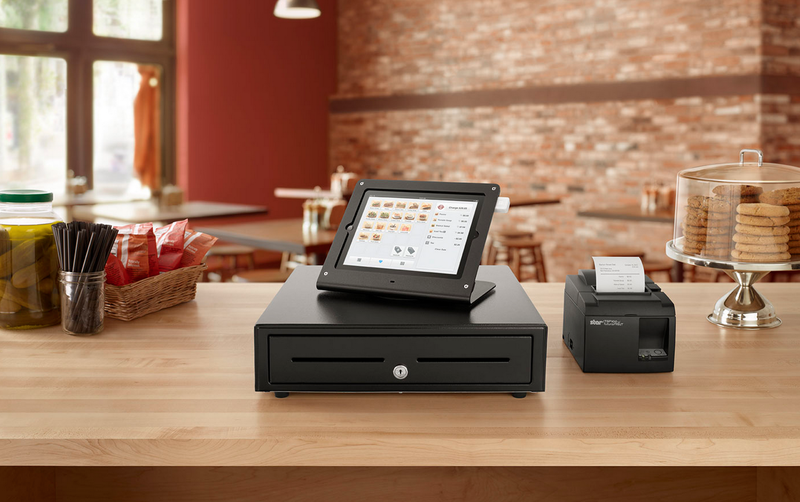 With Business in a Box for Square Register, merchants can now simplify their countertop with an affordable and comprehensive package that includes two Square Readers, an iPad stand, a cash drawer, and an optional receipt printer. All work wirelessly with Square Register. Business owners can learn more about the “Business in a Box” package here. Video of how Almond Surfboards use Square register above.